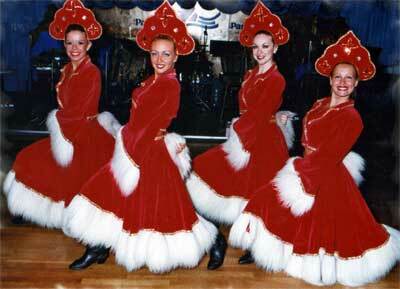 Fully self-contained dance shows with a variety of stunning colorful costumes comprising of 4 to 6 dancers. We can provide you with 6 nights of different shows. Nonstop exciting dance revue shows from between 20 and 30 minutes long with a choice of backing tracks. Add a singer or live band for an hour long super cruise style spectacular. For six month summer seasons at holiday centers, dancers can be available for day time activities such as keep fit, talent competitions and children’s mini shows. Cruises, Summer Seasons, Holiday Centers, Corporate Events and Galas. ShowCreations specialise in providing shows for 5 star international hotels, cruises and holiday centers We hand pick professional entertainers for your individual venue. Producing shows you need and will be proud of. The shows are created just for you and reach a wide range of audience. Circus Celebrations - Parisian Paradise. Or please just let us know your own ideas! All styles are individually choreographed creating a successful show, appealing to adults and children alike. Bring your stage to life with these visually beautiful shows. Book now with confidence and your audience will be dazzled. Sit back, relax and enjoy the show. Whether it is a for a Cruise ship, Hotel, Holiday Center, in the UK or Internationally. Then contact us with a brief e-mail with your venue, dates and an idea of what you might like, or you can give us a call. We can supply you with small shows of 3/4 people going right up to full production shows with 10 dancers, singers, and a speciality acts (The complete cruise style spectacular). 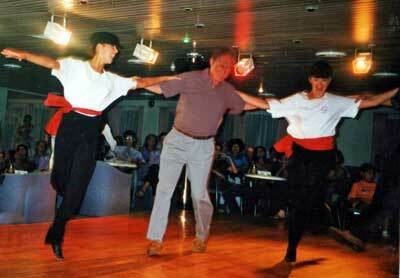 Non-stop dance shows or dance routines to go around singers and other entertainers. 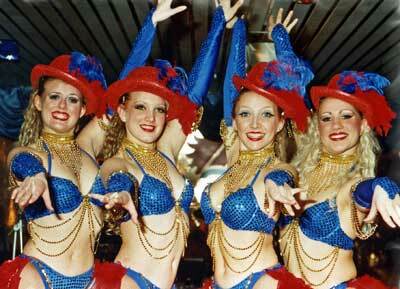 Short 1 month contracts or 6 months long summer seasons with your very own resident dancers. We will create the shows to combine with your venue and with your audience in mind. The entertainers are chosen specifically for each contract. Auditions take place in the UK, and then rehearsals and costume fitting start out in the south of England. Rehearsals will be approximately two-three weeks long. With a rehearsal week in the venue required prior to the contract starting. The shows will be created just for you – themed, even down to the colour of the feather opening routines to match your cruise ship colors. So if you’re sailing to Ireland, there will be an Irish feel to one of the shows or Greece your audience will be clapping away to Zorbas dance. At some holiday centers and hotels for summer seasons the dancers can do daytime activities, if agreed at the beginning of the contract. The shows are carefully thought through for everyone’s enjoyment. And without a doubt, to suit a wide audience, from the young to the mature. Also a variety of worldwide music for the international venues. A stage or a dance floor area, with a changing room close by for the dancers to do their quick changes during the shows. Also music equipment, to play the show music e.g. mini disc, CD player. Each Show is designed to be as simple or complex as you and your budget require ...including collaborations with a variety of international musicians, singers and speciality acts. ShowCreations provide the same professionalism from the small Company Event through to top PR occasions, Product Launches, Cruise Ships to Top Hotel full floor shows.